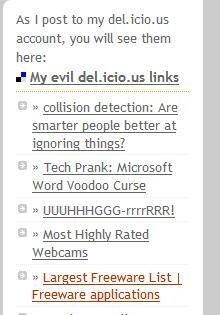 you will see a new addition called "My evil del.icio.us links". It you haven't checked out del.icio.us, then you really need to. It's a "social" bookmarking website. Patrick, what is social bookmarking, you ask? Well, reader - lets take a "for example": I am reading a cool article on how to skin a cat. Normally, if I liked said article - I would just bookmark it for future reference. Reason 1: Bookmarking a link only allows me to access the bookmark on that specific computer - and I use 3 computers. With del.icio.us, I can access my bookmarks from any web connected computer. Reason 2: When I bookmark that site, the title will probably be something like "About.com, Achives September 2005, Feline Stuff". Will I remember to look under this title when searching in my 1000 bookmarks? No.... and then those links become useless. When you bookmark with del.icio.us, you can assign key words - or tags - to every bookmark. So, when I bookmark this article about skinning a cat - I would assign tags of "Cat" "Skin" "How.To" "To.Do" "To.Blog". Then I could search my tags for any of those words and find the link again. Reason 3: There are millions of other people using del.icio.us. They have already read about, and tagged other articles about skinning cats. I can search their tags for subjects and see what the community came up with. Reason 4: del.icio.us/popular. My favorite stomping grounds. This is where del.icio.us places the most popular links of the day, ranked by popularity. It's sort of "World News Tonight" meets the internet. So, in summary - when I post something to my del.icio.us account, it will automatically appear on the sidebar. Come back every once in a while and stalk me. Sounds delicious. An entire buffet of bookmarked links. Mmmm, delightful!